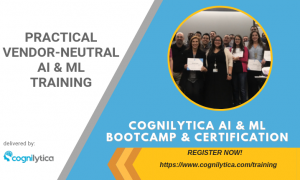 Two primary focuses of Cognilytica’s research is the concept of “Intelligent Assistants” whose primary job is to autonomously perform activities with the intelligence and capabilities often ascribed to humans, and conversely the concept of “Augmented Intelligence” where smart systems enable humans to do their job better. IPsoft is pioneering the space of Artificial Intelligence with a cognitive solution that can provide both Intelligent Assistant and Augmented Intelligence capabilities. Amelia, the company’s cognitive solution, is an AI platform that combines capabilities of Machine Learning (ML), conversational technology, and other aspects of AI to understand, learn and interact with its environment to automate knowledge work across a broad range of functions in the enterprise to improve employee experience and customer satisfaction. AI Today Podcast #29: The First Autonomous Vehicle Fatality — Now What?